IMA’s senior-most country intelligence programme, The India CEO Forum, is a membership-based briefing and research service designed to help CEOs interpret and anticipate developments in the operating environment. For most of our member CEOs, the Forum is not just a source of ongoing information and insight, but also a ‘first port of call’ to seek answers or independent opinions on a wide range of business concerns and ideas. Built up over more than two decades, the 800-member-strong Forum is a tightly-knit community of business leaders across industry verticals. The Forum uses the medium of regular briefing sessions hosted in the NCR region, Mumbai, Bangalore, Chennai and Hyderabad to engage the peer group on relevant issues. Closed-door debate is led by authoritative speakers drawn from government, industry, academia and independent thought leaders. IMA India’s ongoing research and independent insights on the business environment are provided to members through thought leading papers encompassing the Indian and regional economy, strategic and political affairs, industry and market developments and emerging management paradigms as relevant to the Chief Executive. IMA’s Knowledge Centre is a repository of data and insights as well as IMA content archives accessible by members only. IMA’s Executive Briefing service – a personalised country briefing on India - is available to members of The India CEO Forum under special rights of access. These briefings are considered a valuable source of independent perspective on India for global teams or local company strategy teams. Membership to The India CEO Forum is by invitation only. To know more, browse through the tabs above, or write to us. Built around the transforming role – and needs – of Chief Financial Officers, The India CFO Forum is India’s leading platform for serious debate and learning amongst the country’s top finance managers. While fulfilling the CFO’s need for top-level country intelligence, the Forum is also a living and breathing space to enable shared learning among the CFO peer community on emerging business and functional challenges, and to forge valuable, lasting relationships across the peer network. Over 800 CFOs form the network that is The India CFO Forum. The CFO Forum’s peer group sessions hosted across the country centre on issues both current and emergent, that review trends in the broader economy but equally also in regulation and policy for whom the CFO is the steward. Thought-leading speakers drawn from business, government and academia set the benchmark for closed-door debate within the CFO commuity that is frank, intense, and ultimately, very ‘real’. IMA content and insights informs the perspectives of its CFO member community on issues related to Finance, economy and politics and regulation. IMA’s own perspectives are complemented by insightul summaries of all IMA CFO Forum sessions provided to members as conclusions papers. In addition, CFO surveys offer the finest country benchmarks on issues core to the Finance office or indeed, offer the CFO community’s collective view and forecasts on the economy and its drivers. IMA’s monthly thought-leadership journal, CFO Connect, is published for members only, containing an amalgam of writing on issues of interest to CFOs at levels both personal and corporate. Active contribution by IMA member CFOs makes CFO Connect also a journal for CFOs, by CFOs. In recognition of the massive impact that CFOs continue to have on corporate sustainability and growth, IMA instituted The India CFO Awards. Over a decade on, the Awards are the country’s most independent and recognised Award for the community, based on the highest standards of selection by an authoritative jury. IMA’s CFO Awards are restricted to no more than twelve in a series in order to truly distinguish firsts among equals. Membership to The India CFO Forum is by invitation only and open only to Chief Financial Officers. To know more, browse through the tabs above, or write to us. The knowledge economy places talent at the centre of the growth and sustainability paradigm of organisations. In turn then, the CHRO, as steward of that talent drives business outcomes and catalyses organisational change. Leading CHROs across the country are really ‘Chief Change Officers’ who strategically leverage the firm’s human capital as the firm’s competitive advantage and build organisational structures in response to a transforming external environment. The India CHRO Forum’s mandate centres on aiding senior HR professionals to maximise their impact on their organisations by leveraging the power of collective wisdom. With a strong community of 300 CHROs across India, the Forum offers regular closed-door interactions with peers, experts and business leaders. In recognition of the partnership between the CEO and the CHRO, debates are also constituted to engage both peer communities. IMA opinion on key issues in the domain of talent is provided through IMA’s opinion papers. Equally, the power of the network is leveraged for the creation of country benchmarks in HR and businss specific isues through IMA member surveys. The Annual HR Survey is over two decades old and a leading barometer of trends in compensation, employee engagement and development in the country. IMA’s broader papers on the economy and emergent trends are a core part of the value proposition, given the CHRO’s strategic interest in the wider economy as a key member of the country’s industry leadership. To maintain the seniority and relevance of the peer group, membership to The India CHRO Forum is by invitation only and limited to the senior-most executive in the HR function. To know more, browse through the tabs above, or write to us. Customer centricity as a core attribute for organisational success has placed the CMO at the centre of industry’s growth aspirations. The transformative shifts in the marketplace driven both by technology, but also by changing consumer needs and behaviours now demands leadership of response by CMOs across the country. The CMOs’ traditional stewardship of brnds is now augmented by the need to lead company-wide change in response to evolving buying patterns, actively working to mould the firm’s public image, manage enormous complexity (both internal and external), and continually build new marketing capabilities. This complex maze of responsibilities requires CMOs to be multi-faceted, multi-talented, and nimble-footed. 200-members strong, The India CMO Forum brings together a group of peers working to further the stature, credibility, and understanding of the strategic marketing function via the medium of briefing sessions, roundtables, and written content which offer thought leadership and opportunities for networking. CMO Forum members are drawn from India’s senior-most marketing professionals to form a trusted, close-knit community of peers who use their access and expertise for mutual benefit, support, professional advancement, and above all draw on the collective wisdom of the group. Highly interactive, closed-door briefing sessions amongst a uniformly senior participant set are led by authoritative speakers from within the industry, academic and business fields or structured as brainstorms within the peer community itself. Driven by a tightly knit agenda and strong moderation,these sessions are CMO only, focussing on issues core to the CMO’s role as custodian of brand and customer relationships. A select set of joint sessions with CEOs and CFOs centre on wider subjects where the triad of peers has common interest. IMA opinion on key issues in the domain of marketing and brands is provided through IMA’s opinion papers. Equally, the power of the network is leveraged for the creation of country benchmarks in marketing and businss specific isues through IMA member surveys. IMA’s broader papers on the economy and emergent trends are a core part of the value proposition, given the CMO’s need to understand broader economic growth impetuses in the country. All IMA Forum sessions are intelligently summarised and provided as key takeouts to members. To maintain the seniority and relevance of the peer group, membership to the India Chief Marketing Officers’ Forum is by invitation only, and limited to the senior-most executive in the marketing function. To know more write to us. IMA India instituted The India CFO AwardsTM in 2001 to recognise distinction in finance. The Awards honour individuals who demonstrate outstanding capabilities and achievements by combining the imperatives of busin ess leadership and excellence with those of integrity and sustainability. Seeking to highlight best practices and financial excellence in difference Reflecting best practices across Over the years, the Awards have been announced in various categories that reflect best practices and financial excellence across different businesses. The premier category is the ‘CFO of the Year’ Award - for the CFO whose strategic contribution to his corporation is overwhelming in terms of his ability to partner the CEO in decision making and creating unique value addition. Each year, The India CFO AwardsTM are supported through sponsorship by organisations which see merit in the profile of participation at the Awards and equally, appreciate and understand the importance of the finance function. The India CFO AwardsTM aim to provide sponsors with a unique opportunity to gain profile and exposure amongst the ‘right’ audience. The Awards provide sponsor companies an opportunity to demonstrate an explicit commitment to the CFO community across industry sectors and segments. The India CFO AwardsTM reflect the sponsor company’s commitment to excellence, achievement and intellectual pursuit. To that end, they offer an avenue to get recognised as a corporate committed to these values. In a methodical manner, The India CFO AwardsTM seek associations with sponsors who can provide financial assistance, but more importantly, who can provide valuable intellectual guidance, while also be viewed by the audience as ‘thought leaders’ in their area of expertise. The India CFO Awards have been executed successfully for several years. 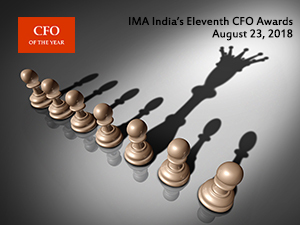 Click here for IMA India's Tenth CFO Awards Image Gallery! Each year, we receive close to 350 nominations from various business sectors and industries. Each nomination is studied and analysed carefully by the Jury, which then shortlists a few finalists in each category. The Jury then meets for a day to discuss these finalists, and basis those discussions and further analysis, the winner in each category is decided. This process is spread over 2-3 months, and is a very detailed and focused exercise.